Anyone Want a "Brand New" Pontiac Firebird? Bummed that Pontiac and the Firebird are gone forever? Here's a possible anecdote to your pain. Most of us have come to terms with the reality that Pontiac is permanently gone. It’s a bummer, but life must move on. For those who just can’t seem to get past the fact GM’s historic excitement division didn’t survive that whole bankruptcy thing, there are a few (pricey) solutions if driving around in a classic Pontiac isn’t to your liking. 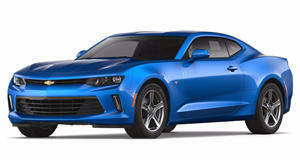 One such answer is this 2011 Chevy Camaro FireBreather. Originally designed for the 2012 film "Jinn", a total of 50 examples were built as part of a limited production run. The satin black beauty is powered by a supercharged 6.2-liter V8 that spits out 600 horsepower and 575 lb-ft of torque. It’s also received a new front fascia with projector-beam headlamps, mesh grille inserts and, of course, that Firebird inspired front end. There are also FireBreather logos inside and out. But something this rare and cool doesn’t come cheap. One of these beauties is up for sale for $64,900 at a Ferrari dealership in Michigan.